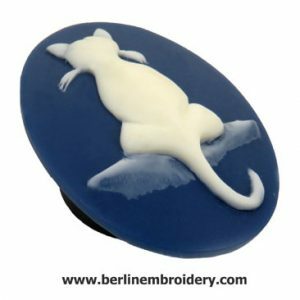 The brass stiletto is a lovely smooth and sturdy tool and is my favourite tool for enlarging holes at the center of eyelets when working my Hapsburg Lace designs. 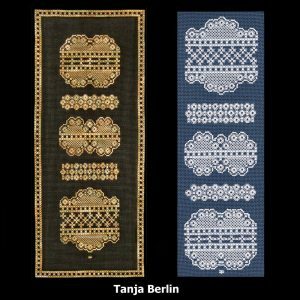 The Hapsburg Lace Eyelets and Lace Sampler is an intermediate canvas work design. The lacy stitches are worked in Perle cotton on 18 count mono canvas. 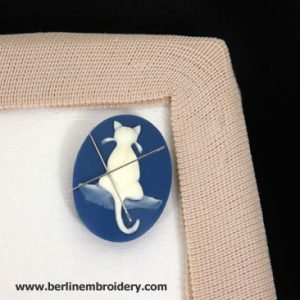 It is an easy technique, great for all level of stitches and can be worked in the hand in your most comfy chair (no frame necessary). It is also a good project to take with you when you are traveling as it is easy to pick up and put down without losing your place and without having to deal with lots of different threads. 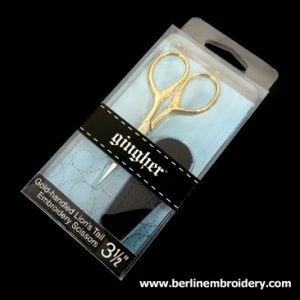 Gingher Lions Tail 3 1/2 inch hand embroidery scissors are high quality precision embroidery scissors that are made in Italy. 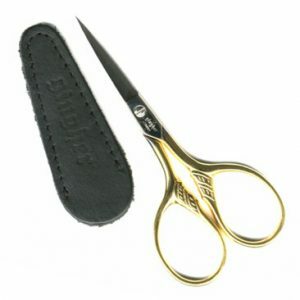 The scissors have smooth and comfortable handles with slender, sharp, yet strong blades and fine points which are excellent for fine hand embroidery and needlework techniques. The brass stiletto is my favourite tool for enlarging holes at the center of eyelets when working my Hapsburg Lace designs. 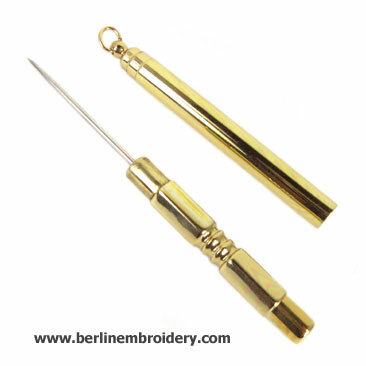 The brass stiletto is a lovely smooth and sturdy tool that can also be used to enlarge holes in the ground fabric of the embroidery to enable a large sewing needle to pass through the fabric easier or for taking the ends of embroidery thread to the back of the work in goldwork embroidery. The stiletto can also be used as a laying tool. The brass stiletto has its own brass cover to protect the point.